Despite the rise of social networks and Twitter, e-mail is still the way many of us communicate. But it can put a tremendous amount of your private data at risk. Here are some tips for minimizing that risk. Bad guys have a number of ways to compromise your account, including brute force attacks (trying username/password combinations until they stumble on the right one); password resets; or intercepting login credentials sent in the clear. The risk: If you’re like most people, your e-mail account contains old bank statements (or links to same), addresses, information about other accounts, maybe even credit card numbers or passwords: It’s a treasure trove for an identity thief. And if an attacker gains control of your e-mail account, he can reset the passwords of other accounts. Finally, an attacker can harvest your friends’ e-mails for spam or phishing attacks. How to protect yourself: The first rule of safe e-mail is: Don’t use it to send critical data. Next make sure you connect to your e-mail accounts over encrypted connections. That means using SSL (look for the lock in your browser) for Webmail and a secure protocol (usually IMAP or POP3 over SSL) for other accounts. Do that on your portable devices as well as on your Macs. The Risk: Your e-mail address alone is worth money to spammers, scammers and other thieves, and is therefore worth protecting. How to Protect Yourself:Use one time e-mail addresses for different online accounts and services. 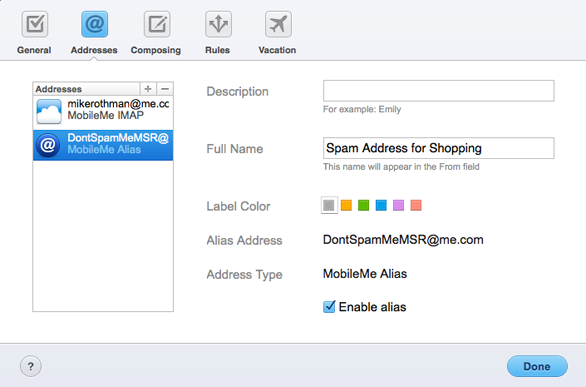 Many ISPs will provide such addresses for free; for example, MobileMe provides up to five such aliases (Mail -> Preferences -> Addresses). If that e-mail address starts getting spammed, you can cut it off without changing your primary address. Some spammers still crawl Web pages looking for text strings that look like e-mail addresses. So make sure your e-mail address doesn’t show up in online forums or blog comments, much less any Websites you control. Or use a simple obfuscation technique, such as you (at) isp (dot) com to make the address harder to recognize. Protect your privacy: what happens to your data?